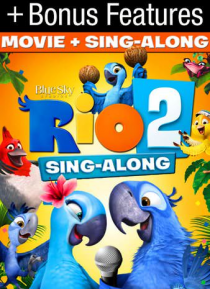 The animated hit comedy Rio returns and now there are two ways to watch: the original theatrical version and this new sing-along version, where the whole family can sing along with your favorites, including Janelle Monae, Kristin Chenoweth, Bruno Mars, Jamie Foxx and more! The party continues when Blu (Jesse Eisenberg), Jewel (Anne Hathaway) and their three kids take a walk on the wild side and em… bark on a colorful, comical, music-filled journey through the Amazon. Whether you choose to watch the theatrical or sing-along version, Rio 2 is really something to squawk about! Includes bonus features.